• Start off by writing your fitness goal and put it up somewhere you can see. Use this as a reminder to tell you that your goal is important! • Set realistic goals. Assess your fitness level with the help of a doctor or physical trainer before setting goals. 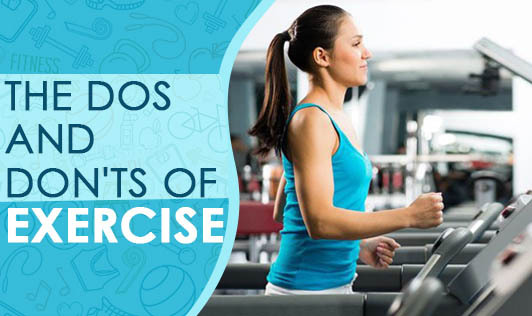 • Start off your workout routine with warm up exercises and end it with cool down exercises. • Workout with a friend or a relative. It helps you keep yourself motivated. • Keep a check on your water intake. • Watch what you eat. Only exercise or only diet will not help in achieving any health goal. Talk to your dietitian to get a personalized diet chart. • Rest! One of the most common mistakes that weight watchers do is not getting enough rest. Our bodies need rest to repair itself from the wear and tear caused by exercise. • Strength training. Find the right balance between aerobic exercises and strength training. It is essential for overall wellness. • Have a positive attitude. The outcome of your goal depends on your attitude. So, be patient and have a good attitude about your workout. • Enjoy what you're doing. Your muscles may hurt the first few days but it is only a good sign. • Wear the right clothing. Avoid wearing anything synthetic and body fitting. • Don't expect overnight results. I hear a lot of people complain that they have been working out for2 weeks and haven't seen any changes! Your body needs time to change and adapt. So, give it time and have patience. • Don't compare yourself to others. This is one of the biggest blunders and a de-motivator. Your body is different from others and hence it reacts differently. • Don't give up. If you can manage not to give up during the first month, you have pretty much made exercise your routine. So, make sure you stick to your regime for a month at least. You will not have to struggle much after that. • Don't workout randomly. Stick to your prepared schedule. • Don't lose out on sleep. Sleep keeps you energized and helps in repair. • Don't forget to reward yourself for the good work you have done. Do not use food as reward. • Don't over exercise. Your body can only handle limited amounts of anything. So don't stress your body out. • Don't dehydrate or over-hydrate yourself. Always carry a bottle of water with you while you workout. Take sips of water only when your throat dries out. • Don't get bored. If you do, take someone with you for company. • Don't forget to breathe. Breathing is absolutely essential to carry oxygen to the working muscles. Concentrate on keeping your breathing steady. • Don't tense up your muscles. Keep your muscles loose to get better results. Keeping these small things in mind while working out will go a long way in maintaining good health!